Stop quests from starting automatically. Pursue the quests you want, ignore the ones you don't. Make your choices matter. Teabag86 for putting together the Legendary version of this mod. Carried over a couple of minor changes from USLEEP (small grammar/text changes to the quest "An Axe to Find"). Updated a handful of scripts with recent changes from the Unofficial Patches. 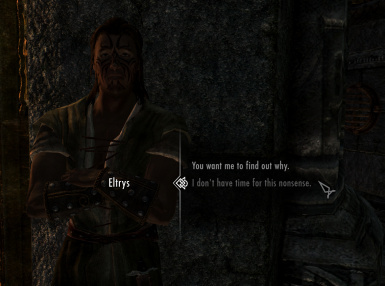 LEGENDARY/DAWNGUARD: Reading the book "The Aetherium Wars" will now present the player with a choice to pursue the quest "Lost to the Ages" or ignore it. Added "Rise in the East"
Changed "The Man Who Cried Wolf" so the quest wouldn't start until you talk to either Elisif or Falk. Greatly improved the dialogue options for the quest "Lights Out!" Carried forward changes from USKP Version 2.0.6 and earlier. Incorporated relevant changes from Even Better Quest Objectives; a patch is no longer needed as long as TCIY is loaded after Even Better Quest Objectives. Incorporated changes from USKP v2.0. Hopefully fixed issue where Azura's quest would dominate rumor dialogue. 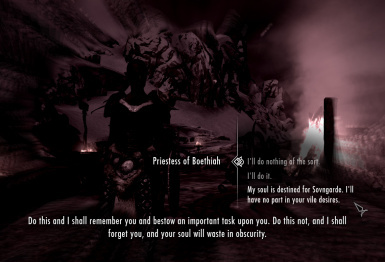 Removed "Stendarr" reward for refusing Boethiah. Gauntlets were not deleted from the file, so players who have already received the reward won't lose them. Asking further questions of an Afflicted will result in a map marker for the Shrine of Peryite getting added to the map. Made a handful of changes to various quest scripts in order to carry over recent USKP fixes. Added "A Return to Your Roots"
DAWNGUARD: updatd "Rising at Dawn" script to include changes added by Dawnguard. DAWNGUARD: map marker should no longer get added each time you hear dialogue about Dawnguard. Added "Thieves Guild" (Maul only; you still need Thieves Guild Requirements for Brynjolf). Corrected several scripts so that quest objectives acquired prior to installing the mod will still be completed properly. Added a separate Dawnguard version. Added "In My Time of Need"
Added "The Raid" and "Supply & Demand"
Added "The Man Who Cried Wolf"
FIXED GAME BUG: Made previously unused dialogue available for "Soljund's Sinkhole"
Do you ever hesitate to speak to NPCs out of concern that you're just going to get another quest added to your ever growing list of journal entries? Well no more...feel free to ask people questions and listen to their stories. You won't be given quests unless you agree to help them. 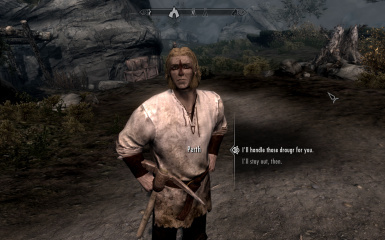 This mod will stop random greetings, comments, and rumors from triggering quests, as well as having forced encounters with NPCs automatically trigger the start of a quest. Now those quests won't be activated unless YOU decide to pursue them. In addition, there are times when you are given a choice to refuse a quest, but the quest will automatically start regardless of your decision or you are forced to agree to do a job before hearing the details. Now quests won't start until you agree to them. To avoid being bombarded by two dozen quests in the first 20 minutes of the game and, later, to avoid having unwanted quests added to an already overflowing quest journal. To increase the number of choices available in the game. 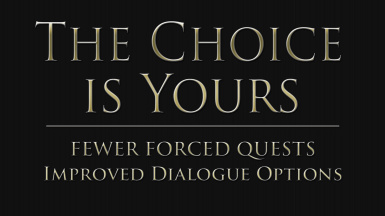 When you talk to someone and there is a dialogue option to refuse the quest, choosing that option should not start the quest. To add a bit more interest (and perhaps even some additional challenge) to the game. If you've played through the game already, you likely know where you need to go for many of these quests. 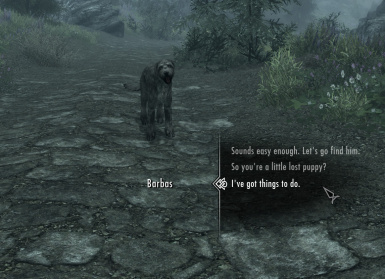 If not, then you'll have to actually pay attention to what the NPCs tell you. The game won't take you by the hand and lead you around with map markers pointing to the start of every quest. You'll need to keep your eyes and ears open and figure it out on your own (quest markers that appear after you've started the quest are unchanged and will still show up once you've begun the quest). To enhance immersion and role-playing. Certain quests may be contrary to the nature of your character, and you would just as soon not have that quest recorded in your journal as if your character would actually consider it. Or perhaps you've done the quest a dozen times already and just don't care to do it again. Now you can avoid having those unwanted quests cluttering up your journal. It doesn't change every quest. ONLY the quests listed HERE have been changed. It doesn't delete dialogue or remove quests or NPCs from the game. You'll still hear all the same rumors and greetings. After all, these conversations help flesh out the world and allow you to interact with its inhabitants. Also, any new dialogue responses use existing dialogue. 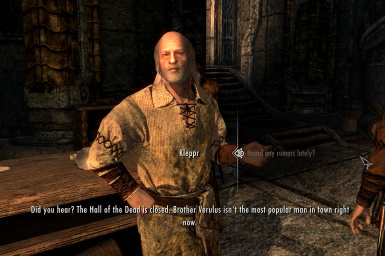 This mod doesn't add any unvoiced dialogue. It doesn't delete or break any of the quests. You can still complete each quest as before, but the quest itself (including quest markers and journal entries) will not be given to you until you make the conscious choice to pursue the quest. Be aware that, in many cases, directly encountering the quest objective will still advance the quest. If you decline a quest, you can still change your mind and choose to pursue it at any point in the future. Any exceptions are noted below. It doesn't delete journal entries and quest objectives that are already logged in your journal prior to installing this mod. I strongly recommend using a mod manager to install this mod. The Legendary version requires both Dawnguard and Dragonborn. If you do not have both of these DLCs, then use the separate versions provided under Optional Files. Once you have actually initiated the quest, in most cases it will run just as it did before, including all the vanilla quest markers and journal entries. However, the following quests have more significant changes made to them. They either include additional completion options or other adjustments to quest itself. Details related to these changes can be found HERE. Thank you to Teabag86 and Rusey for helping to create, test, and update the Legendary and Special Edition versions of this mod. Thank you to DrMonops, Thenryb, and AlturDrake for helping test this mod.